Spectra: Spectra obtained by U. Munari (Astronomical Observatory of Padova, INAF) and P. Valisa (ANS Collaboration) on Nov. 25.792 UT, and by R. Itoh, Y. Kanda, Y. Moritani, and K. S. Kawabata (Hiroshima University) on Nov. 25.37 show the variable to be a reddened classical nova past maximum. Spectroscopy details may be found in CBET 3724. Charts: Charts for V556 Ser may be created using the AAVSO Variable Star Plotter (VSP) at http://www.aavso.org/vsp. 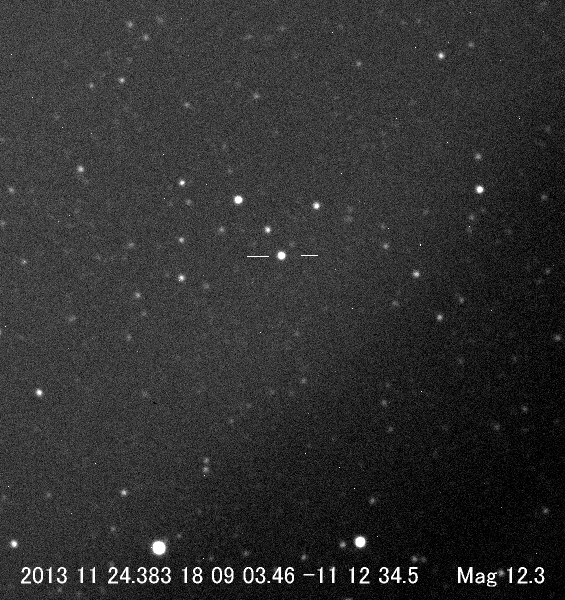 Submit observations: Please submit observations to the AAVSO International Database using the name V556 SER. a. Announced on IAU CBAT Central Bureau Electronic Telegram 3724 (Daniel W. E. Green, ed.) and IAU Circular 9264 (Green, ed. ); all information in this Alert Notice except for observations reported directly to the AAVSO comes from those publications. b. The object was designated PNV J18090346-1112345 when it was posted on the Central Bureau's TOCP webpage (http://www.cbat.eps.harvard.edu/unconf/tocp.html). c. Itagaki posted his discovery image at http://www.k-itagaki.jp/images/Ser.jpg. d. P. Schmeer (Bischmisheim, Germany) notes that an apparent star (H = 20.9) in the UKIDSS near-infrared Galactic Plane Survey has position end figures 03.433s, 34.39". e. E. V. Kazarovets reports that Nova Ser 2013 was given the permanent GCVS name V556 Ser. Congratulations to Itagaki-san on his latest discovery!